Every time I make cupcakes I think of Sweet Cuppin’ Cakes from Homestar Runner. I used to watch those StrongBad emails ALL. THE. TIME. They were so stupidly funny. Kids’ Book will always be my most favorite of favorites. Anyway, semi-completely-unrelated to this I made cupcakes yesterday. For reasons I have yet to figure out US boxed cake mixes are not sold in Italy. Personally I think this is a huge mistake as the Italians go nuts for the box mixes at the US commissary. The only box mixes you can find over here create dense, dry cakes that are not unlike the cakes you would find in a pastry shop or at a restaurant. I personally am not a fan of dense cakes unless it is a lemon poppyseed pound cake and in that case I will eat the whole thing myself. Many of the recipes you find online end up producing denser cakes that either end up dry or have a ton of ingredients all in an attempt to keep the cake moist. A year or so ago I decided to try the chocolate cake recipe on the back of the Hershey’s Cocoa container and have never looked back. It is so light and fluffy and not at all dry. It has a nice chocolate taste but doesn’t feel like you’re eating something so rich that you couldn’t have two or three of them. Traditionally, as in all four times I’ve made these cupcakes, I’ve made a buttercream frosting that is either vanilla flavor or the vastly more popular and delicious Bailey’s Irish Cream flavor. Not having a hand mixer here and making the hard but necessary decision to leave our fancy new stand mixer back in Maryland meant I was not able to make the buttercream for these cupcakes. I just don’t have the arm strength. It was a disappointment since my only other choice was to go with store bought frosting. Let me just tell you up front that aside from the Bailey’s frosting, which is way too easy to eat in large quantities, I am not a fan of frosting. I’ll take a glaze or a light coating of icing but those cakes with gobs of flowers and 2″ of frosting as well as a thick layer inside make me want to barf. The smooshy texture and super sweetness just make me sick so I’m very particular about the sugary coating of my desserts. I went with a vanilla Duncan Hines creamy something-or-other frosting knowing that I could just add some real vanilla extract to it to make it taste less, um, crappy. (My apologies to those who like store bought frosting. May I suggest making your own some time so you realize how horribly wrong you are to like it? Have you looked at the ingredients? You should.) I also bought some little sprinkles because I like cute things. What? You eat with your eyes first so why shouldn’t my food be cute? Preheat oven to 350 degrees and line muffin pan with bake cups. Mix the dry ingredients together and then add the liquids making sure to add the boiling water last. The batter will be quite runny. Depending on how big you want your cupcakes to be fill the cups 1/2 – 2/3 full. Bake for 22 – 25 minutes depending on your oven. (I checked after 20 because our oven runs hot.) Allow to cool slightly in the pan before removing to a cooling rack. Makes 24 – 30 cupcakes. Frost. Place the butter in a large bowl and mix until creamy. Slowly add the confectioners sugar 1/2 cup at a time (it will fly out of the bowl so prepare to get covered) until you get the desired consistency. Once the sugar has been incorporated add the Bailey’s and the milk. Now here’s where taste comes into play – if you like a strong taste of Bailey’s you may need to add more than the 3 – 4 tablespoons. I’ve been known to add 6 – 7 because I want it to be obvious. This is totally up to you. In the event the frosting ends up softer than you’d like just add a little more sugar to stiffen it up. To frost the cupcakes you can either just use a pastry knife and slather it on or use a ziplock bag that has the corner snipped off. The larger the hole the wider the strip of frosting will be so keep that in mind. 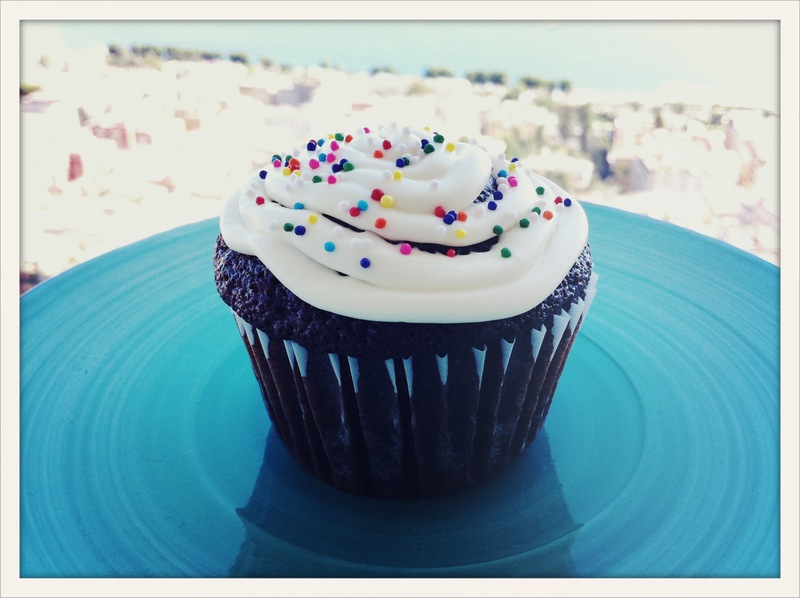 I’m always on the look out for other cupcake recipes so if you have any good ones that you’ve tried be sure to pass them on! Hey you! Do you like cheese? I don’t mean those neon orange pre-wrapped slices of cheese product, although at one time I thought they were the bees knees, no, I mean curdled animal milk. Do you like curdled animal milk? Maybe I should start over. Excuse me, are you a fan of cheese? When you think of snacking does the image of a nice block of sharp cheddar come into view? Or maybe a lovely salad with gorgonzola, walnuts, and pears? How about a french baguette and some brie? Those are all delicious options but may I offer you something even better? Something so deliciously creamy it almost melts in your mouth? A cheese that has a sweetness that cannot be replicated by other lesser cheeses? That little white ball of amazing that doesn’t need to be consumed with anything else but still plays well with a super thin slice prosciutto or a freshly picked tomato? What kind of wonderous cheese is this? Why mozzarella di bufala, of course. What? You’ve never heard of such a thing? Or maybe you’ve heard of it but never tried it? Oh, so you’ve tried some form of it in the Italian restaurant down the street and don’t see what the big deal is? I’ll tell you what the big deal is, you need to get yourself on a plane and come to Naples to try some mozzarella di bufala, for reals. See, here’s the thing, me and milk products we don’t get along so well. We had a nice thing going for years and then one day…let’s just say we’re no longer friends. 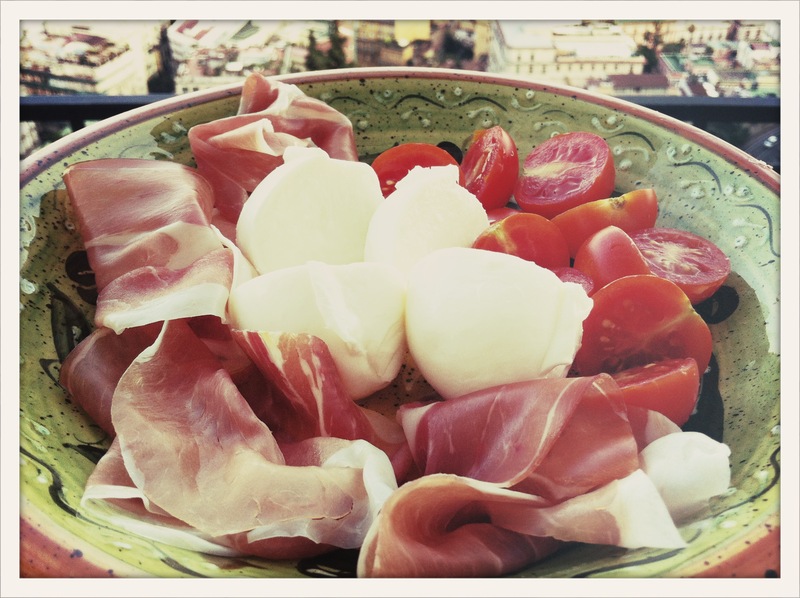 The thing is that for whatever reason I can eat buffalo mozzarella with no problem. Since I haven’t eaten cheese in a couple years I’ve kinda been going crazy with the mozzarella. The best way to eat it is straight up but the other night we had it with prosciutto and tomatoes, it was pretty delicious, I highly recommend it. The gnocchi only take a few minutes to cook so it’s better to do the sauce first but make sure to put the water on to boil. 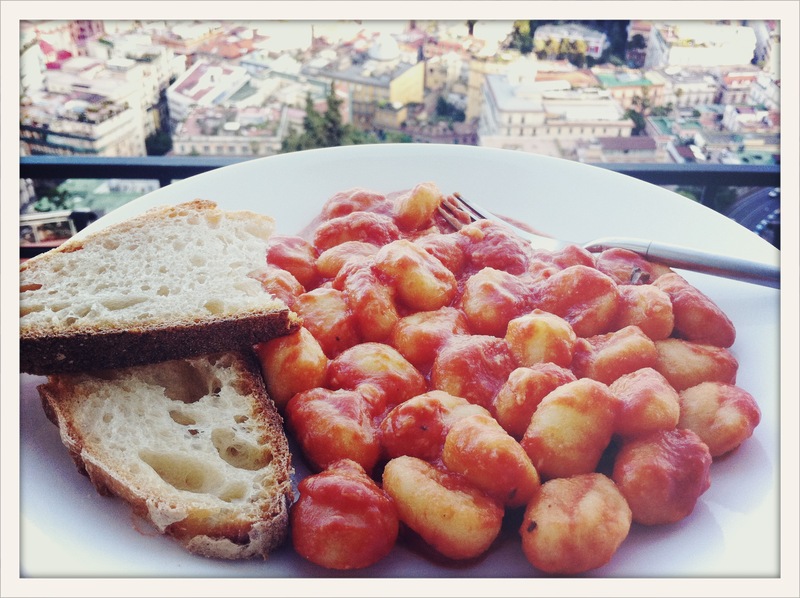 Put all of the ingredients except the gnocchi and cheese in a pot and bring it to a simmer. At this point you’ll need to check the seasoning for the sauce – if it’s on the bitter side adding a little sugar or honey will help get rid of that. Once the water boils make sure to salt it before putting in the gnocchi. After cooking for the allotted time (usually 2-3 minutes, they’ll float when done) drain the gnocchi and return to the pot. Add the tomato sauce and the cheese to the gnocchi and stir to combine. Recipe makes enough for 2-3 people. Traditionally this would be put in a dish and placed in the oven for several minutes to melt the cheese further and create a sort of crust but, again, lazy me isn’t going to take that step. We had it with some chewy Italian bread and some red wine. If you can’t make it over here to try it then at least give it a try at home. I like food, do you like food? 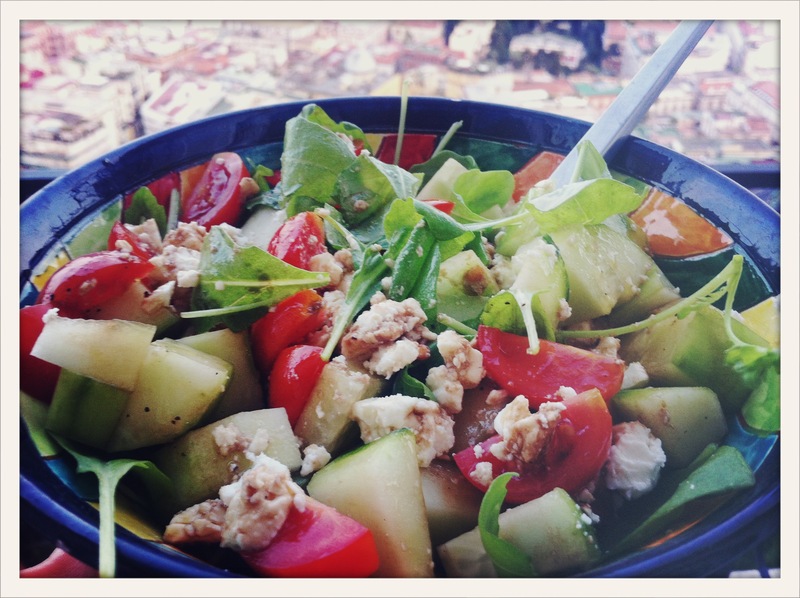 Process the cucumber, tomatoes, and arugula and place in a bowl. Crumble the feta on top. In a separate bowl, or dressing shaker bottle, mix together the olive oil, balsamic vinegar, and honey. The honey will help to emulsify the dressing and sweeten it just a bit but is completely optional. Finally add salt and pepper to taste. You can of course add more or less of the oil and vinegar depending on how tangy you want it to be. Pour the dressing over the salad just as you are about to serve it. Enjoy! It’s a pretty straightforward salad and it would be easy enough to add or substitute other things such as blue cheese for the feta, spinach for the arugula, and maybe include walnuts, pecans, red onions, peppers, or olives, whatever floats your boat. You could also sprinkle on some oregano for a more authentic greek salad taste. If you try it let me know what you thought of it.